There’s this myth that some groups don’t get fat. 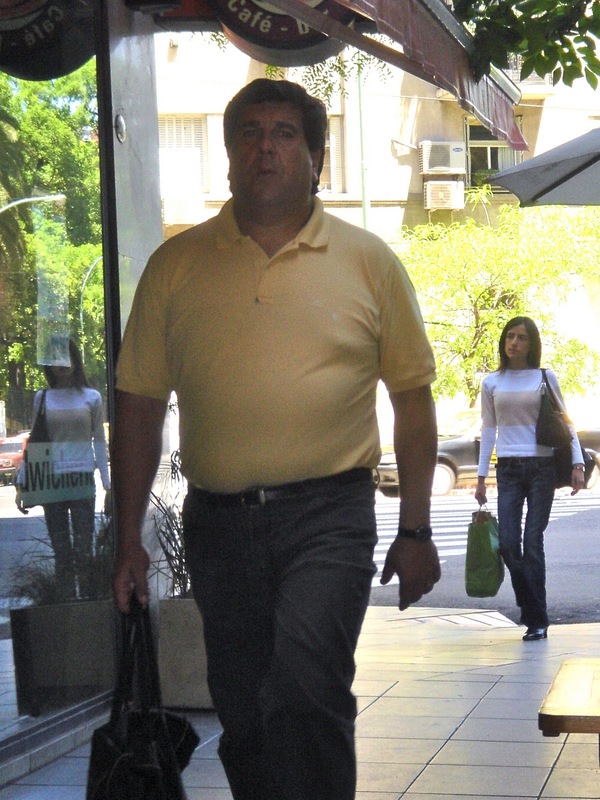 It surfaced in Mireille Guiliano’s 2004 “French Women Don’t Get Fat,” which became a New York Times bestseller, and more recently, “Gay Men Don’t Get Fat” in January 2012. The latter is by the elfin Simon Doonan, a former Barney’s window dresser, who lives in New York with his equally elfin husband, the potter and home fashion retailer, Jonathan Adler. Anyway, a recent Saturday restaurant outing seemed destined to throw down the gauntlet on those myths. The Restaurant Dieter, his husband and two other couples had reservations at Atmosphere in Atlanta’s Midtown neighborhood. The restaurant is French. The staff and quite a number of the guests speak with impossibly charming accents. The menu is mother-sauced within an inch of its life. As Midtown is the epicenter of gay Atlanta, this restaurant knows we’d all like to be as elfin as Doonan & Adler. So when asked, “What on the menu is light and low fat?” the server — himself thin and either gay or European, or both — didn’t miss a beat. He identified a pan roasted trout amandine and said it could be prepared without added fat. He also didn’t blink when I asked that a salad of Belgian endive, apple, walnuts and Roquefort cheese in a red wine vinaigrette come to the table completely deconstructed. This allowed me to limit the fattening parts — the cheese, dressing and nuts — to about a tablespoon each, which didn’t harm the combination in the least. The trout picked up a slight sheen in the pan, probably from a little fat used to toast the slivered almonds. It was well-cooked, flaky but not dry, and tasted just fine with the almonds scraped off to the side. The added fat — olive oil and capers — came in a small portion cup that I left untouched. The fish came with haricot vert, baby carrots and fingerling potatoes, all prepared with minimal to no fat. I left the restaurant feeling incredibly virtuous, especially because I didn’t get dessert. Others went for the profiterolles, but as this was a gaggle of gay guys, of course they shared. Review: Joel Robuchon, Las Vegas, Nev.
Once upon a time in Las Vegas, big name chefs like Michael Mina, Wolfgang Puck and Joel Robuchon were M.I.A. Sin City was more closely associated with the $9.95 prime rib buffet than with haute cuisine. The restaurant in question was Wolfgang Puck’s Postrio and the meal was quite good. In the years since, other big name chefs have set up shop. That explains how, on a recent trip, we found ourselves at Le’Atelier Joel Robuchon at the MGM Grand Casino. We’d sampled his work once before at the critically acclaimed L’Atelier de Joel Rubochon in Paris. The meal is a distant memory from pre-weight-loss days, but it was sumptuous in every respect and served at a high counter top where every diner faced the open kitchen. It was our first experience with dinner as theater. Why pay attention to your spouse when you can watch the Cirque du Soliel of food prep? Given his acclaim, was there really any other choice but to order the $155-a-person, Menu Decouverte de Saison (Seasonal Discovery Menu)? Nine courses, including two that were dessert? That can easily ruin a diet. But as I’ve noted before, high-end cooking often relies on expensive herbs and ingredients to satiate customers, not the huge portions seasoned with sugar, fat and salt found at an Applebee’s restaurant. We ordered thinking there was at least a chance I’d be safe. Wrong. 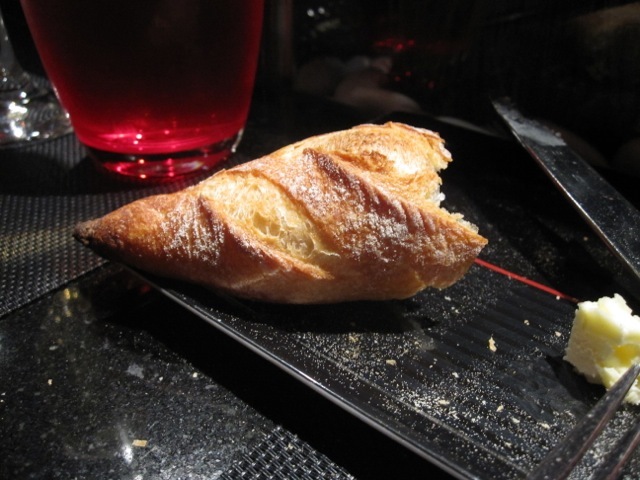 The saboteur was the bread basket: hard-crusted mini-baguette with deeply browned tips; a flaky croissant and a chewy roll. These are any carb-loving dieter’s real enemy, because of how the body processes high-glycemic foods. They convert quickly to sugar in your bloodstream and dissipate just as fast. Your body wants more and soon enough, it’s off to the races. I fell immediately. My share of the bread was gone before the amuse bouche and the server brought more. 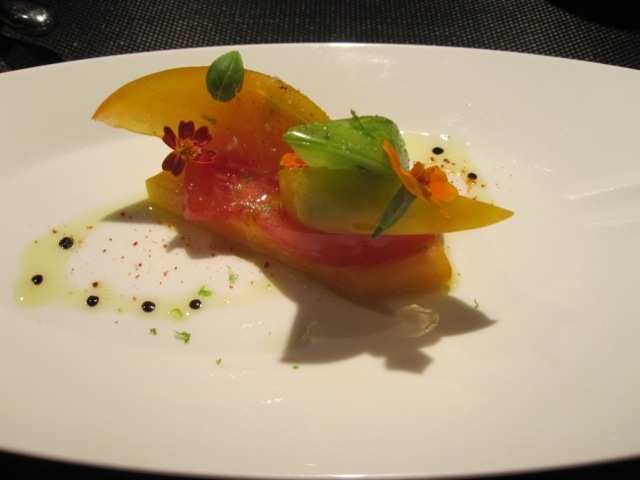 Fortunately, what immediately followed was a parade of more diet friendly courses: an architectural and fresh salad of multicolored heirloom tomatoes finished with touch of basil oil and sea salt and a langoustine carpaccio splashed with a dab of lemon oil and studded with, micro chives, chile pepper and toasted poppy seed. A tiny section of crab leg came topped with julienned bell pepper and carrot that had been softened in a lemongrass oil. But the crab itself was so tender and sweet it was easy to push the garnish aside. Most stunning was an asparagus kebab topped with a tiny quail egg, swimming in a deep, woodsy mushroom foam and topped with sewing-needle-sized bits of Iberico ham. A slightly larger portion could have made an excellent vegetarian entree and — with careful rationing of the mushroom foam — a healthful diet dish. But thanks to the bread, I’d thrown caution over, eaten two more savory courses (a turbot with a buttery shellfish sauce and a lamb shoulder confit) and both desserts. Let me repeat that. Both. Desserts. Completely. The first was strawberries with a moscato gelee and lemon sorbet, buried beneath white chocolate shell. The second was a warm apricot tart with almond cream, thyme foam and ginger ice cream. The subtle thyme accent complimented the sweetness of the tart and ice cream perfectly. Consider this a post from The Failed Restaurant Dieter. Exceptional bread does it to me every time. 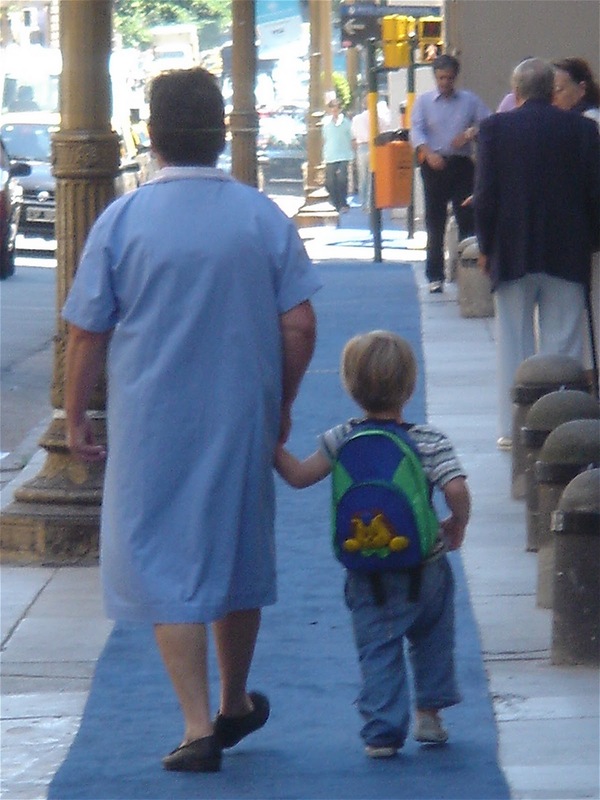 Even after 16 happy years of marriage, some couples find they have no other choice but to go their own ways. It happened to us. No lawyers needed, though. 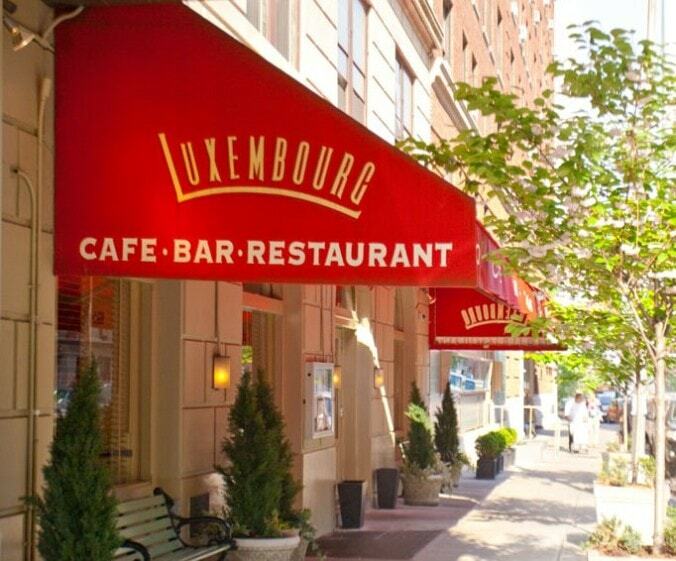 So The Restaurant Dieter wound up at Peacefood Cafe on Manhattan’s Upper West Side and TRD Spouse at Le Relais de Venise in Midtown. The names alone should be sufficient to capture the irreconcilable divide, but the details are too amusing not to be chewed over again. I’ve previously written about our household culinary divide. It heightens every time we get off the plane at LaGuardia. I want to stop at the Fairway on Broadway to stock up on fruit. He hopes it’s not too late to get a chocolate eclair up the street at Beard Papa. Yesterday’s lunch was 16 years of marriage, played out in a single meal. TRD: Peacefood is a neighborhood joint, one of two where the stroller-pushing lefties who inhabit this stretch of the Upper West Side can get their fix of kale soup while the children eat chicken-nugget-ish baked soy with fresh herbed vegan mayo. Everything about it is clean, from the wide open windows and whitewashed walls to the menu that proclaims “eat differently” at this “vegan kitchen and bakery.” Even the waitstaff is clean, in a sort of skinny, scruffy hipster way. Would you like an organic cotton hoodie with your tempeh avocado sandwich? TRD Spouse: A few weeks ago my boss was staying on the Upper East Side of New York and asked for some dining recommendations. 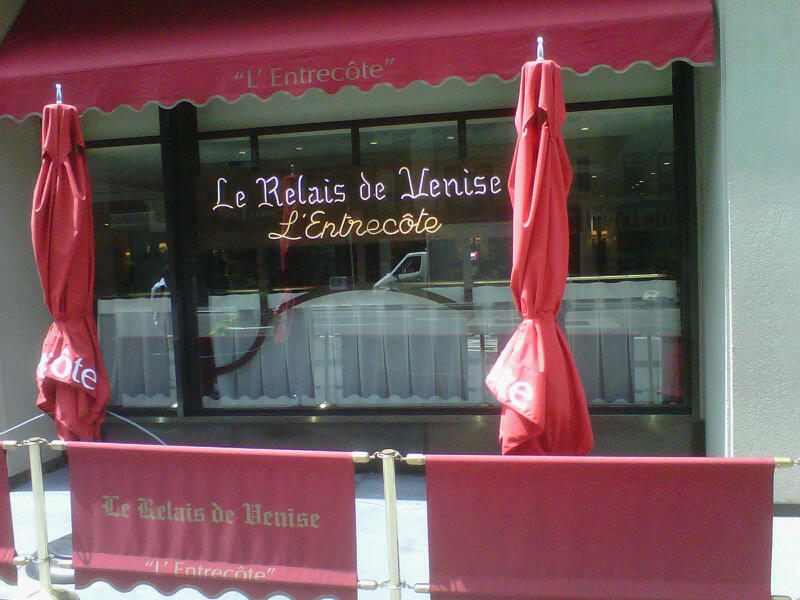 I suggested Le Relais de Venise, which is also called “L’Entrecote,” the French word for what Americans call a rib-eye. He had a delicious meal and returned to the office with a receipt offering 20 percent off lunch, which he left on my desk. How could I let it go to waste? 99 degrees and no takers for sidewalk dining. TRD: Lunch offerings are on a single menu with salads, soups, vegetable bowls, sandwiches, panini, pizzas and sides. In the evening there’s an expanded list of specials. 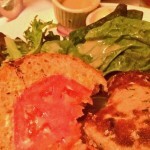 Like all such restaurants, it can be a mistake to confuse vegan or vegetarian with low fat and low calories. A look at the bakery window proves that: there’s no shortage of calories in the mile-high lemon vanilla layer cake or the coconut cream pie. And onions do not get caramelized with out some fat. But there are so many choices that celebrate the ingredients rather than fat and sugar. It’s easy to choose something that tastes light, healthy and virtuous. To get started, you tell the waiter how you’d like your steak done — I told her “medium” and she scribbled an “M” on my table. 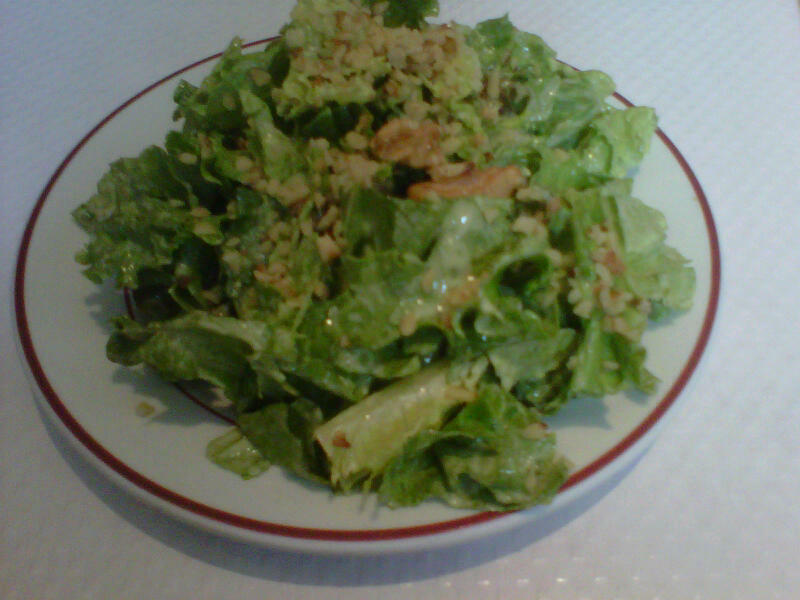 The salad arrives right away — lightly dressed with a zingy mustard vinaigrette and crumbled walnuts on top. One marker of being on vacation, even a short weekend one, is wine with lunch. 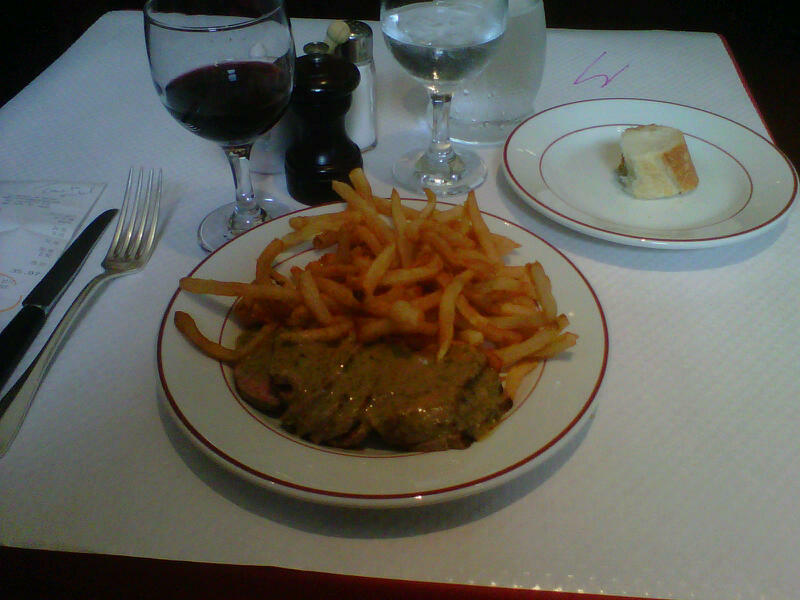 I ordered a glass of ’09 Pierre Amadieu, a tasty Cotes-du-Rhone, from the short list of French wines. A second one followed. The steak arrives with a green, tarragon-y sauce over the perfectly-prepared steak. The frites are golden, crispy, chewy, duck-fat bathed beauties. Now comes the LRDV magic. As you’re about to clean your plate, sopping up the last of the sauce with the very last frites, the server comes by and offers…seconds! 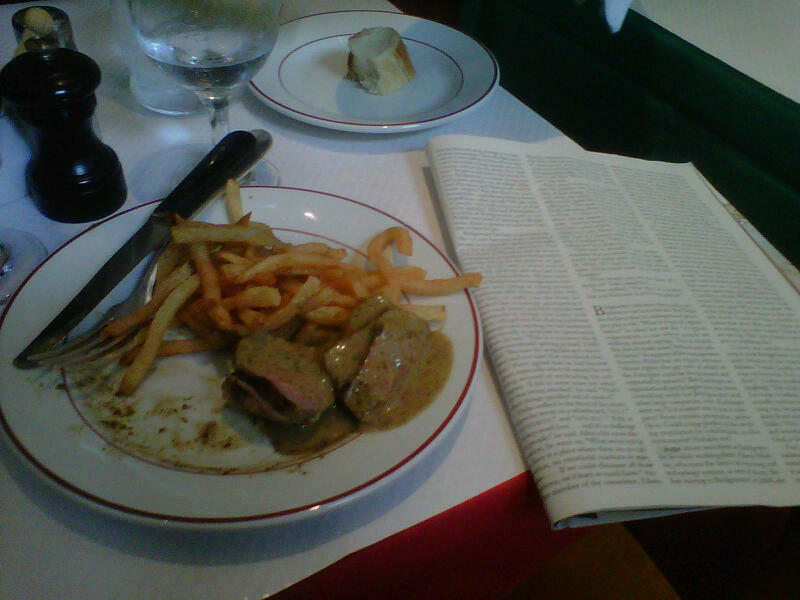 Just a morsel or two more of steak and another small pile of frites. Oh, heaven. TRD: Peacefood’s wonderful selection of baked items and desserts beckoned, so lunch had to be light enough to accommodate a little dessert afterward. Protein is always a concern when I eat vegetarian, so I went for the fluffy quinoa salad with white beans and baby greens and asked for a side of baked tempeh. The idea was to add the latter, marinated only in tamari, to the salad. I nursed a $3 iced peppermint tea — $3? Even in New York? — and waited. 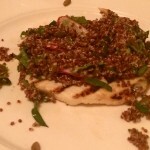 One might expect the quinoa mounded atop the greens, but it arrived mixed. The creamy mustard lime vinaigrette was extremely subtle — none of the headline ingredients poked through. Instead, it served as a canvas from which all the component ingredients could stand out: crunchy raw corn kernels, peppery arugula, sweet red onion, red pepper, creamy avocado and finally, the nutty quinoa itself. It was wonderful. The only unfortunate note was the lack of beans. 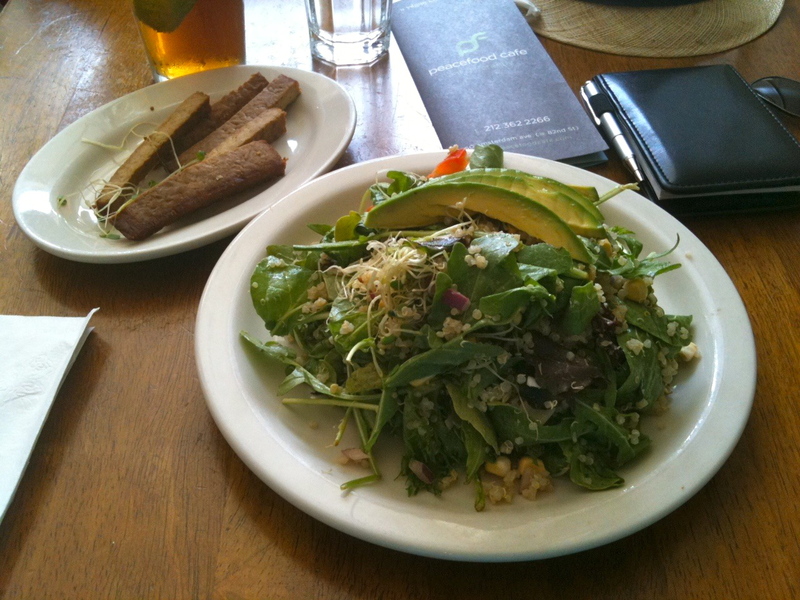 When I pointed that out, the server offered to get more of something else to bulk up the protein — avocado or more quinoa. Because of the mixed in tempeh (5 grams of protein per ounce) I let it go. I was sorely tempted by a generous slice of the lemon vanilla cake — all the slices are generous — but in food-happy New York, with one meal for the day yet to go, I opted to conserve instead. 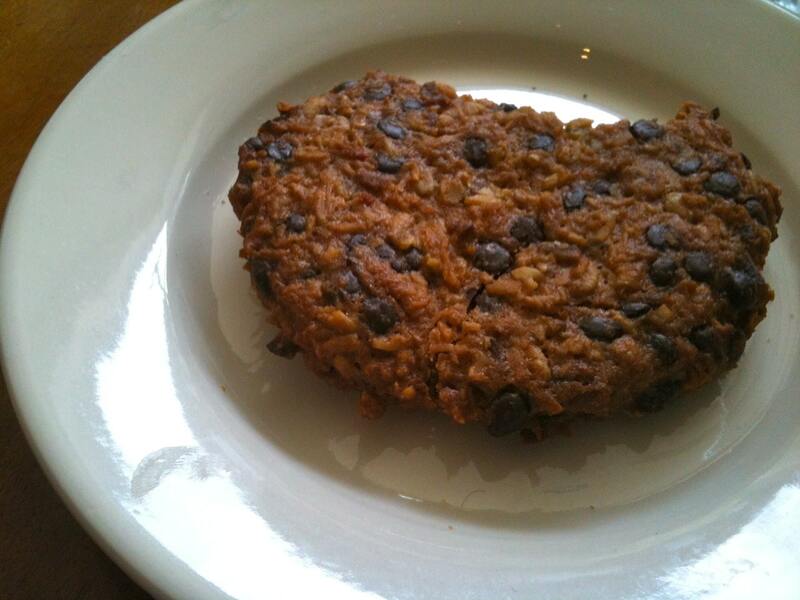 A cookie with chocolate chips, coconut, pecans and carrot sufficed. It was chewy and rich, but not overly sweet. I’d call it a cookie for an adult. 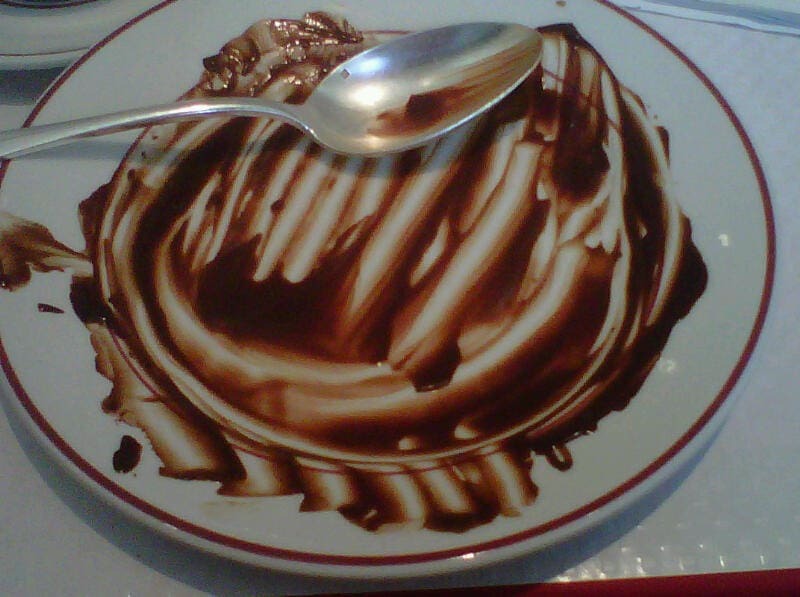 TRDSpouse: I have one hard-and-fast rule when dining out: If profiteroles are on the menu, I’m ordering them. And so I did, along with a cup of cafe Americain. And they were delicious but, sadly, no second helping on dessert. One quirk at LRDV is they don’t offer heat-ups on coffee. Sayeth the server: “We don’t do refills. If you’d like another one, I can bring it to you.” And so she did. For $3.25. TRD: As with any restaurant meal, the nutritional information can be difficult to assess. The vegetables in the salad are all negligible; except the corn (perhaps 1/4 to 1/2 cup), they’re all zero points on Weight Watchers. 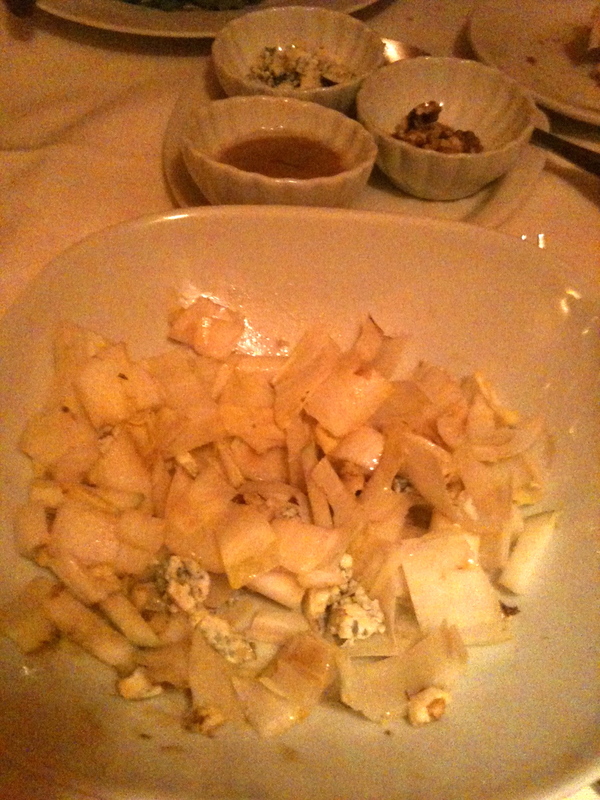 The salad was dressed so lightly that at most, it would be two tablespoons of a full-fat dressing. Four ounces of baked tempeh are about 220 calories and 12 grams of fat. The cookie was modest sized, not the fashionable monster size that is more accurately at least six. For Weight Watchers points, I counted the corn at 1/2 cup and wound up at 15 points. Not bad for lunch in the big city. Then, this morning, a 5 mile run through Central Park.